Kanchanaburi was nice where I staied 1 week coming from Bangkok, at the river, roaming its surrounding tropical locations, partly on cycle, meeting all kind of people from married Thays with Aussies, local people at small pubs at nights and having fun. 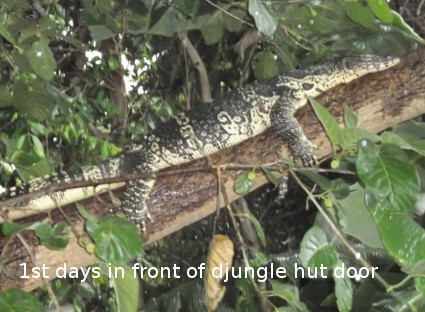 The 2 big Asian Water monitors at the Pile hut close to the river, Sharing a bath in the river not far from Monitors hunting, surrounded by magic plants and biotops. Thayland is yet nice and of many mixed and different places from north to south, djungles with national parks, tropical islands with nice beaches, some also set in rocks, and Thayland changed a bid over the years during military rule. Many places on the land are often of more easy going simple character, beside mainstream tourism, and here and there the difference can be disturbing when you get the feeling that some people are living under pressure as they had the conflict between the yelow and red shirts some years before. Depending on locations you can find all from mainstream tourism to magic locations beside the beaten track, like in djungles and along rivers. Climate is tropical and megacities like Bangkok have changing atmospheres by the pollution and in special after heavy rains, also cats along streets show on that. Moist can be that thick that it gets heavy, mixed with street pollution it can be a bad mix. 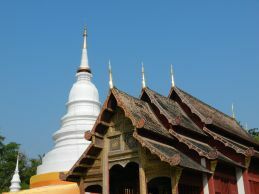 People then take care nicely of their home places surroundings often with small temples. Bangkok is huge but organized with many special locations, I liked the hidden places, often along waterways and nicely decorated. Some of them with Lotos and small fish which is needed as a good antimoscito force. Exchange rate for euro is about 35 Bht for 1 euro (at the time), thats about the percentage of money missing after 10 days only, even without the nightcirkuses, beaches and fantasies. 30 % of money are gone somewhere ... I do not engage with aerbitch. It is the most costly country of southeast Asia, even without spending in cirkuses. The more they are smiling in the morning, the more something can be wrong, Thays are by tradition smilers and usually friendly, what can be to much somtimes. In tourist regions they like to proove their skills by your pockets (seems to be magic), got observed and approoved. Its a land under military rule beside the cirkuses what did not change over years. Even as climate is best fitting I have not seen locals taking bath or swim in the rivers, in cities it would be often too dirty anyway and only the most robust fish can take that dirty waters, what is a big difference to usually clean seawater shores and beaches with clear waters, also good for scuba diving, rivers are often very dirty. I have not seen locals swimming in rivers, even as climate would fit perfectly for a good refreshment. Some of the rivers are with interesting fish, beside the water monitors and Lotos often flowering along highways, Kanchanaburi has also a good aquaristic shop. "Massieren lassen bis einem die Kokosnuesse auf d Kopf fallen." when you got postcards sent and delivered, you did a good deal ! From january to march 2013 i travelled Southeast Asia alone for about 1 month. Later I met with Tarantuli and took her from Bangkok aerport, we travelled on together 3 weeks for 3 countries, what is quite little time for that. 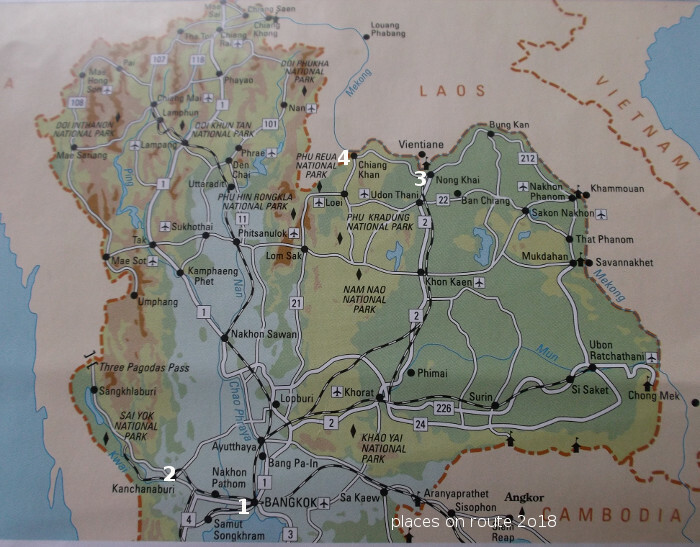 So we had to make a selection like Hua Xai, from there down the river Mekong to Luang Prabang (Laos), Ankor What near Siem Reapcity, 4000 islands and Otres beach (Kambodia) where we met with some friends. Which is partly the new refuge location for ex Goa freaks and hippies ... got later back via Thayland. Usually i take more time but Tarantuli had only 3 weeks max holiday time. 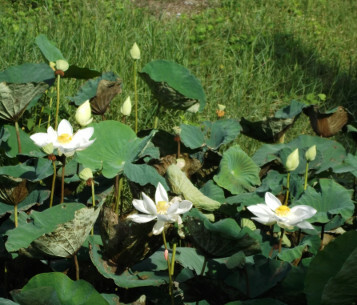 Health: In general no problem, have good sun protection, here and there moskito nets may be of need, but even in small water pots with lilies you can find the moskito larve eating fish. During monsoon time moving barefoot in wet fields can be risky to bites of bloodsucking worms (Blutegel) Sleeper busses in Kambodia can be a hardship. I haven t been much around in Thailand, I came in from Indonesia via Singapure by plane and Malaysia by bus, the port from where you get to Ko Phangan is named Suratthani, Ko Phangan itself is a beautiful island, with villages and djungle, beach huts and bungalows along the coast, some kilometers from the next island Ko Samui. Usually the seawater is very clear, only between the islands Ko Samui and Ko Phangan the water is dirty. There are some very nice bays and beaches on Ko Phangan, the main and famouse party spot is Haad Rin beach at the south end of the island, had a good time there, chicken soup was special, met some nice British people. In short my trip in southeast Asia, somewhen in the late 90s I flew to Jakarta, left by train to Surabaya and travelled by ship to Sulawesi, returned to Lombok, further to Bali, Java, by train to Jakarta, flew to Singapur, passed Malaysia by bus and headed on to Ko Phangan/ Thayland where i staied about two weeks, left Thayland via Bangkok. Health: not a big problem, in case you ve wounds take care of infectiones, have good sun protection.